Atlanta Braves manager Brian Snitker was hit in the neck with a foul ball during Saturday night's game against the New York Mets. 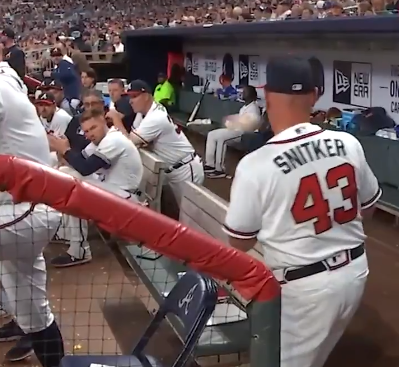 Snitker was standing by the railing on the steps of the dugout as the foul ball was hit in his direction. Snitker saw the ball coming but didn't have much time to react, as the ball hit him in the side of the neck. Snitker was OK, as he calmly picked up the ball and rubbed his neck where the ball hit him. He was very lucky. Snitker finished out the game, and the Braves beat the Mets 11-7.